Late at night at the end of May in 1932 when I was wandering round the garden of my home at Carlisle I saw, with the aid of a torch what appeared to be, on the wood framework of the greenhouse, a sub-adult female Ciniflo similis (Bl.) spider in the jaws of a Segestria senoculata which was apparently eating it. Wondering how so small a spider could prey upon another larger one I made a more careful examination and discovered that both spiders were in fact Segestria senoculata. The smaller one, a male, was in the act of pairing with a female. The male, head downwards, was attached to the woodwork and part of the snare line of the female by its fourth pair of legs. 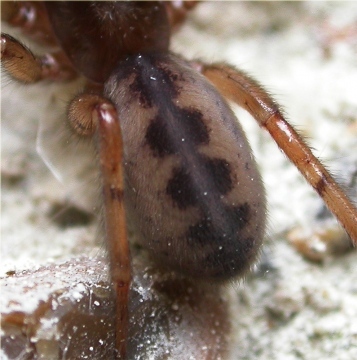 The female was held at the pedicle, suspended in the chelicerae of the male and partly supported by the forelegs while the palpi of the male were directed below the abdomen of the female to the epigyne. It was difficult to see the palpal organs as these were almost out of sight. The legs of the female were all directed dorsally and stretched out beyond the cephalothorax, and, apart from some slight twitching of the legs, the female appeared to be in a submissive comatose state. The period of coition was brief. When the spiders separated, the male wandered off, the female eventually retired to its retreat.